On display in Tel Aviv, and proving to be one of the most fascinating exhibitions in town, are ten portraits of 20th century Jews created by the late Pop artist Andy Warhol shown in dialog with paintings and mixed media works by seven Israeli artists. This series, donated to the Museum of the Jewish People (Beit Hatfutsot) from the estate of Allan S. Bird, USA, dates from 1980. That is, almost 20 years after he produced his famous silkscreen paintings of Campbell Soup tins, followed by photo-based portraits of many ‘celebrities’ from Mona Lisa to Elvis Presley and Marilyn Monroe. To the condemnation of much of the art world, Warhol made unprecedented use for these portraits of the silkscreen process, adopting a recent commercial development whereby the image was no longer cut by hand but applied to the screen by photo-mechanical means. As a result the ‘soul’ was virtually taken out the image, especially when Warhol produced the same image as a series. By this means, he succeeded in exposing the shallow character of mid 20th century urban life, obsessed with fame, glamour, status and commercialism. Accusations of commercialism were also leveled at Warhol when he produced his prominent Jews series, selected from a list prepared by his Jewish art dealer Ronald Feldman, “because I liked their faces.” Condemning this project, Hilton Kramer, then art critic of the New York Times wrote: “(It would be) vulgar and offensive if the artist had not already treated so many non-Jewish subjects in the same tawdry manner.” But as it turned out, this series was enthusiastically taken up by Jewish communities in America. Invariably exhibited together with biographical notes on the Jewish ‘celebrities”- as it is in the Beit Hatfutsot exhibition – it actually became an educational tool perpetuating the legacies of Jewish luminaries whom it is doubtful that Warhol appreciated their contribution to life in the 20th century. 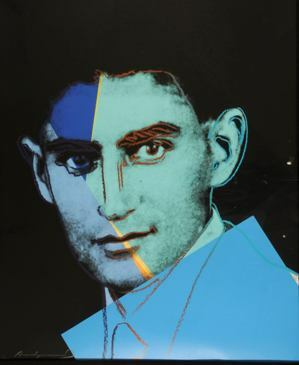 Among the ten people given the Warhol ‘treatment’ (from the arts as well as science and philosophy) are Franz Kafka, Albert Einstein, Martin Buber, Golda Meir, Sarah Bernhardt and the Marx brothers. As may be seen in this exhibition, Warhol made no attempt to convey the personality or social milieu of his subjects, either by his choice of colors or any other means. It is true that he focuses on their eyes, but in effect the finished portraits are little more than deconstructions of well known photographs. Faces are reduced to mere outline sketches overlaid, in most instances, by garish patches of color or by shadows concealing portions of their faces. For this viewer, the interaction of the Israeli artists, all influenced in some way by the phenomenon known as Pop Art, supplies the fizz in this show where curators Geula Goldberg and Irena Goldberg have assembled a high quality group of artists, each of whom have something pertinent and different to express on the role of icons in local culture. 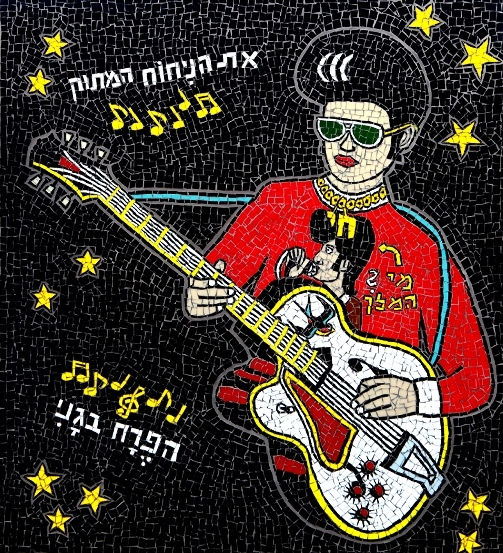 In Ido Shemi’s delightful offering the central figure is Elvis Presley strumming his guitar (Elvis features in Warhol’s portrait series but his image is based on a different photo.) In Shemi’s version the ‘King of Rock and Roll’ wears a shirt decorated with the figure of the late Zohar Argov, the undisputed local King HaMelekh of Mizrahi music (a genre combining Middle Eastern and Mediterranean styles of Israeli music). Inscribed in Hebrew on the shirt are the words: Who is the King?. The title of one of Argov’s best known songs HaPerakh BeGani (“The Flower in My Garden”) is scrawled alongside this hybrid figure. It is interesting to note that Argov like Elvis died young and in tragic circumstances. Choosing to produce this work in the medium of stained glass, Shemi, perhaps intentionally, is expressing the fragility of life as a celebrity. 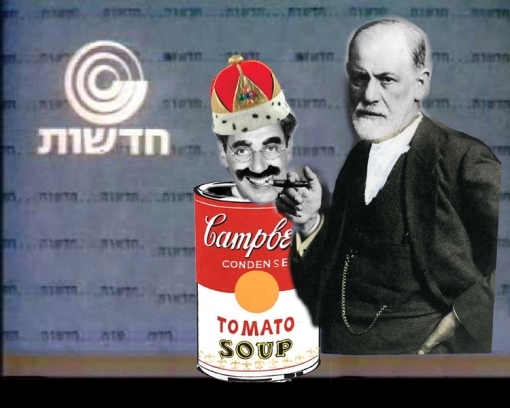 Making fun of Warhol and his efforts as a silkscreen artist is the amusing scene dreamed up by Hadas Reshef in which Groucho Marx pops his head out of a tin of Campbell’s soup. His keynote attribute, a cigar, lighted end towards his mouth, is held by none other than Sigmund Freud. Alongside, is a second work by Reshef that is neither humorous nor appropriate, it consists of a cut out photo of World War II heroine Hanna Senech who parachuted into occupied Hungary on a mission to save Jews but was caught, tortured and executed. Reshef ‘seats’ Senech on the beach at Sdot Yam (the kibbutz she joined in 1941), all around her, people are engaged in aimless activities. 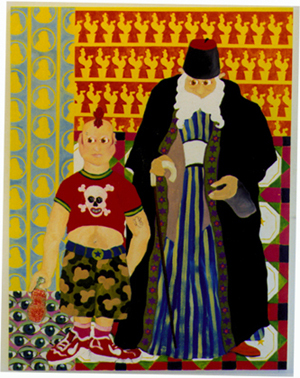 Eliyahou Eric Bokobza is known for his brilliantly colorful, deceptively naïve paintings based on photographs which are actually critical statements of Israel’s efforts to produce a “new man out of the Israeli melting pot.” On view here is his painting Tempo, an effective example, depicting a local religious icon, the late Rabbi Kadouri, a Mizrachi sage and kabbalist. His companion is a punk figure, a young Israeli with shaved head wearing a tee shirt decorated with a skull and crossbones clutching a bottle of lemon fizz in his hand. The ‘wallpaper’ behind them, composed of repetitive images of Sabra plants and the profile of Herzl, refers to a time when the Zionist dream waxed strong and bright. Celebrity caricatures by mixed-media artist Hanoch Piven that have appeared regularly in Haaretz newspaper and publications abroad, possess all the wit and empathy lacking in Warhol’s colorless representations of famous Jews. Among his superb assemblages are his portrait of Golda Meir, her bun of hair made from steel wool and her body stuffed into one of the ‘sensible’ shoes she invariably wore. 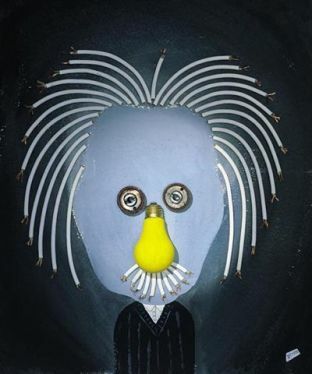 And then there is his portrayal of Einstein in which a light bulb becomes his nose, screws for eyes, with sheaves of electric cable forming his distinctive hairdo. Unique among the works on show, David Tartakover’s portraits of cultural heroes of Tel Aviv evoke real nostalgia for the past. Drawing inspiration, it is true, from American Pop Art in his methods of presentation; he nevertheless keeps the images in these evocative posters closely tied to local history and art. For instance, one notes that his depictions of the poets Uri Zvi Greenberg and Avraham Shlonsky are inspired by portraits painted, respectively, by Reuven Rubin and Sionah Tagger. A typical portrayal is that of the actress Hanna Rovina. 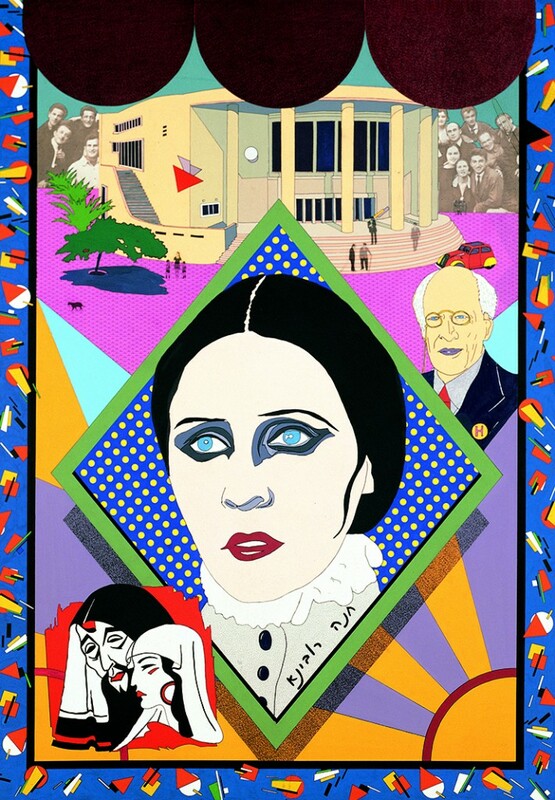 Here, aside from a portrait of her face made up for one of her famous roles, Tartakover includes photos of her mentor, Russian theater director Stanislavski and colleagues in the Habima Company, with the theater itself set in the background of the picture. It is interesting to note that Yigael Tumarkin, an artist who has struggled to reconcile his German roots with his life in Israel, is represented here by mixed media portraits of two German Jews, Franz Kafka and Walter Benjamin also ‘caught’ between two cultures. However, these portrait sketches overlaid with the scribbles, crosses and hand-prints that are part of Tumarkin’s lexicon of symbols make little impression within the context of this exhibition. The final contributor to this show Shy Abady shows a set of sensitive oil and electric pencil drawings of Hannah Arendt, (1906 – 1975), an influential German Jewish political theorist shunned by the Israeli establishment following her criticism of the way that the Eichmann trial was conducted. Unlike Warhol who did not aim much further than creating superficial Pop heroes, Abady’s portrayals of Arendt at different periods in her life seek to establish a solid identity for a controversial figure who never became a Jewish icon. 2 Klausner, Campus of Tel Aviv University. Until mid Nov. Previous articleCurtain Up 2010: Mark Your Calendars! Superb effects.Very creative and innovative. I would like to know if the Alan Bird who donated the 10 Warhol screenprints lived in Rancho Santa-Fe and Maui. I was friends with him, his wife Myrna and daughter Judy and son Josh. I have long since lost touch with them and I actually saw the collection in their home in Racho Santa-Fe, Calfornia. I had no idea that he passed away. If your curators know this I would be most appreciative of this information. The display of different styles is the most striking among all. I love the way these artistic pieces are presented. Terrific review of an exhibition that I was unaware of, which I will now make every effort to view before it closes. I am interested in reading more material written by Angela Levine. Thank you for a stimulating read this morning! It is good to note that Bet HaTfutsot, by the way, is breaking away from its “stodgy” exhibitions and offering us modern/contemporary art lovers another institutional venue in Tel Aviv to see provocative art.